Are you looking for a way to woo your sweetheart on Valentine’s Day? 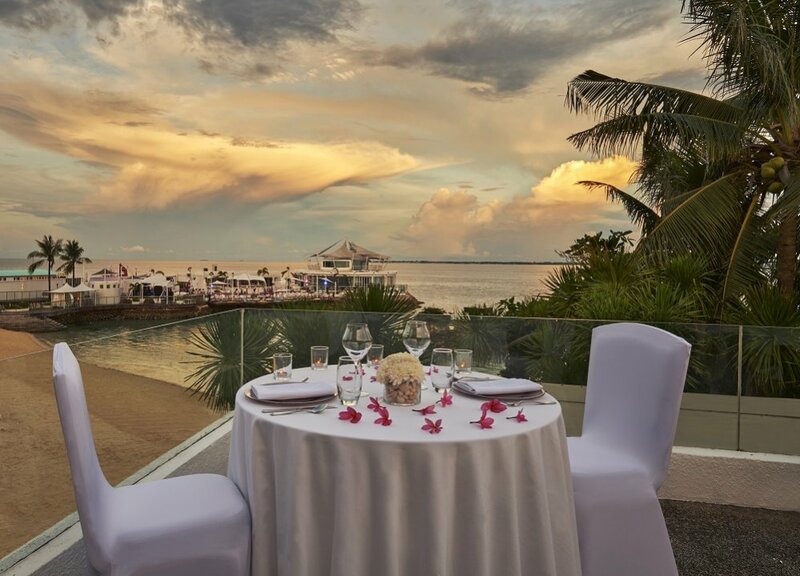 Fall in love all over again at one of the most romantic destinations, Mövenpick Hotel Mactan Island Cebu. There is no better way to spoil your loved one than with one of the resort’s dinner specials on 14 February 2019. The Sails, the hotel’s all-day dining restaurant, offers a delectable dinner for only PHP1,900 nett per person, inclusive of free-flowing wines and a scoop of Mövenpick Ice Cream. Ibiza Beach Club, the hotel’s award-winning dining and entertainment venue, offers couples its Balearic-inspired signature 15-course grill, with generous servings of delectable meats and seafood. The dinner is priced at only PHP3,500 nett per person, inclusive of free-flowing Manny O. wines. Couples can book any of the private dining spaces such as Cabana, Garden Gazebo, Beach Front and Spa del Mar terrace, which they can enjoy exclusively for four hours, from 6.00 pm to 10.00 pm. This is packaged with a butler-serviced private dinner, featuring a five-course menu created by the hotel’s “Chef Wars” champions, along with a bottle of Manny O. Celebrus Brut sparkling wine and a scoop of Mövepick Ice Cream. Each couple is offered the package rate of PHP10,000 nett for a dinner in either Cabana I or IV. The same rate applies for those who wish to have the dinner setup at the Beach Front or Spa del Mar terrace. Other venues, such as the Garden Gazebo and Cabanas II and III, are also available for exclusive use at PHP8,000 nett per couple. Make the most out of your quality time and book Mövenpick Hotel Mactan Island Cebu’s Suite Packages, offered only for overnight stays on 14 February 2019. Make it a Valentine’s Day celebration to remember with a romantic overnight getaway in a suite, complete with sumptuous dinner and breakfast for two. Enjoy a dreamy escapade in a Suite King room for only PHP24,000 nett, including a complimentary Valentine’s Day dinner at the Ibiza Beach Club and breakfast served in bed the following day. Treat your sweetheart to ultimate indulgence by booking the Presidential Suite at only PHP 80,000 nett. Your booking comes with a welcome pick-up service from Cebu City via a Porsche Cayenne and a butler to attend to your needs. Your 5-course dinner is beautifully set in the privacy of your room, added with a special bouquet and a bottle of Dom Perignon Brut NV. This package also comes with a massage treatment at Spa del Mar, as well as a sumptuous breakfast in bed served with a bottle of Manny O. Celebrus Brut Sparkling Wine. For reservations, please call +63 32 492 7777 or email hotel.cebu@movenpick.com. Visit www.movenpick.com/cebu or follow @movenpickcebu on Facebook, Instagram and Twitter for regular updates on flash deals and promotions.